A consistent, daily quiet time. This one should be (hopefully) obvious. If we want to seek Christ first, we must spend time with Him. This is one that I know is so important, but I struggle with it sometimes. You can read more about that here- Confessions of a New Mom. So, how can we be better about this in 2015? Find someone to hold you accountable. Pick a time that you can be consistent with (morning, right before bed, right when you get home from work, etc.). Create a plan (we will talk about this more in a bit), but knowing what you’re going to read and where you’re headed in the Bible will help you not feel lost when you sit down to have your quiet time. If you’re a new Christian or aren’t familiar with how to do a quiet time, find someone who can help you. Read the Bible in books. Let’s say I gave you the latest Nicholas Sparks book for Christmas. Would you jump straight to chapter 4? Or would you read a sentence or paragraph from chapter 6, then read a sentence or paragraph from chapter 9? No, that would be crazy! Then, why do we do this with the Bible? I think it’s because we get intimidated by just diving into a book of the Bible with no devotional or something similar to “guide” us. However, I challenge you to pick a book of the Bible, start in chapter 1, and read from there. However much you want to read daily is up to you and the Holy Spirit. Before you read, ask God to reveal Himself to you, and He will. Pick a book you’re already familiar with, that has meant something to you, that you’re already studying in church, etc. I really believe this will grow your love for God’s Word and your understanding of it. Read the Bible looking for where it points to Jesus. Often, we read the Bible with a “me” attitude. We read asking question such as how can I be encouraged, what can I learn, etc. This is important, but the Bible is all about Jesus and His plan for redemption. Therefore, we need to read it that way. As we seek Jesus by reading with Him as the focus, then He will use His Words to encourage us, transform us, etc. As I am doing my quiet time, every time I find something about God- whether it be something He has done, something about His character, or something He has said- I jot it down. After I finish my reading, I go back through and spend time in prayer praising God for those things about Him. It has been awesome focusing on Jesus instead of me, and it has allowed me to learn so much more about His character and the things of Him. Show up to church expecting big things. I am so guilty of going to retreats or events such as Passion expecting God to work in big ways, but not taking that same attitude with me to church weekly. Mark 4:24 says, “‘Consider carefully what you hear,’ He continued. ‘With the measure you use, it will be measured to you- and even more. '” Our pastor gave a great application with this- if we come to Christ with a teaspoon, He will give us a teaspoon, but if we come to Him with a big galloon barrel, then He will give us that. I previously have gotten big things out of retreats and such because I was expecting big things. I show up with my Bible, paper, and journal ready to intently listen to the pastor and take notes. However, I have just shown up at church with a “teaspoon,” and that’s all I got. Lately, God has really convicted me about this. The past few Sundays, I have been taking notes, intently listening, and expecting big things as I enter church. God is true to His word, and He is filling my galloon barrel. I challenge you to show up to your church with the same attitude. Memorize Scripture. I will admit, I am guilty of not doing this as I should, but God commands us to hide His Word in our hearts. There are so many reasons to memorize Scripture. Having God’s Word in your heart will help you in temptation, provide you encouragement, nudge you with conviction, and help you be ready to share the Gospel with someone. This year, some of the college girls at church and I are embarking on a Scripture memory journey, and I cannot wait to see how the Lord uses this throughout 2015! 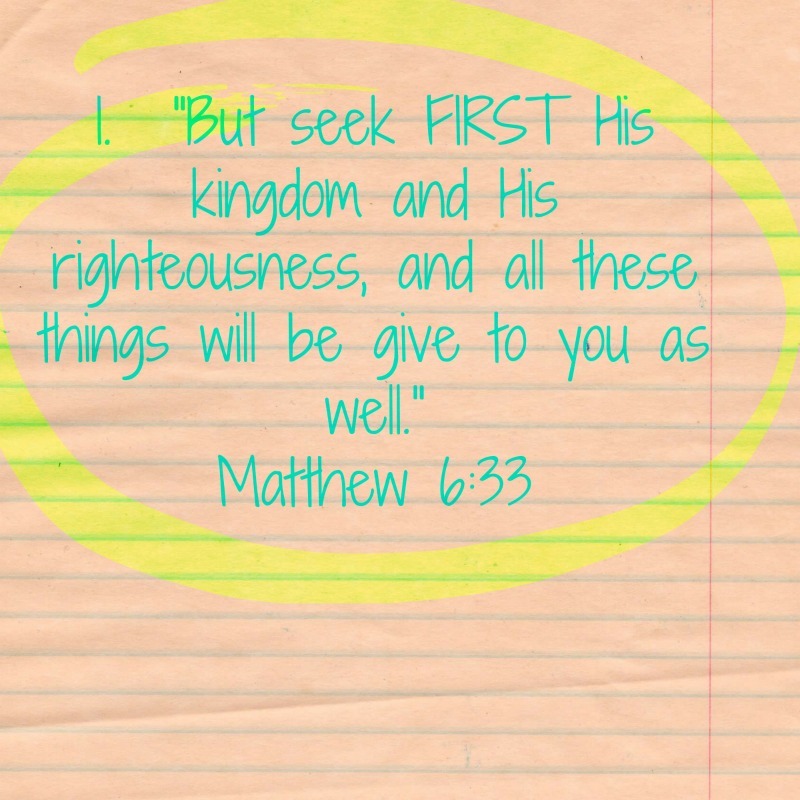 I urge you (along with myself), to seek Christ first and wholeheartedly as we begin 2015. If we truly seek God first, then I believe that we will look back on 2015 this time next year in awe of what God has done. If you do not have a personal relationship with Jesus Christ, there is no better decision to make as we begin 2015. Please, ask me about that, or someone else that you know who follows Christ. Jesus is faithful, and following Him is so worth it! Happy New Year, everyone!